Not a single woman in the banned age group has so far reached the temple which will close tomorrow. Pamba: Six women were prevented from the entering the Sabarimala temple Sunday by a large number of devotees of Lord Ayyappa as the stand-off over entry of women of menstrual age into the famous hill shrine continued for the fifth day. The devotees, up in arms against the implementation of the Supreme Court order lifting the ban on entry of women in 10-50 age group, chanting Ayyappa mantras blocked the four Telugu speaking women from reaching the famed shrine amid high drama. Though attempts were made by some young women, including an activist, to enter the temple of the 'Naishtik Brahmachari', the eternally celibate deity, since Wednesday, the devotees backed by priests have stood their ground, saying they would not allow the tradition to be breached. By all available indications, not a single woman in the age group of 10 and 50 has so far reached the temple which will close tomorrow at the end of the monthly puja. BJP demanded a special assembly session to seek the Centre's intervention, while Congress sought an ordinance by the NDA government. The Pandalam royal family, the traditional custodian of the Sabarimala temple, alleged the CPI(M)-led LDF government was trying to destroy the sanctity of the shrine of the "Naishtik Brahmachari" by taking women in the menstrual age group there. On Sunday, a 47-year old woman reached up to the 'Nadappandhal' close to the sanctum sanctorum, but was prevented by the devotees chanting "Swamiye Saranam Ayyapa" after three others were stopped en route to the hills. An elderly woman devotee who was present at the spot said as the identity card of the woman showed she was born in 1971 and had not attained the 'permissible age", the other devotees started chanting Sarana mantra. They were part of a pilgrims group visiting temples in Kerala and other women not in the 'banned' age group were allowed to climb the holy hills by the protesters. After the women were brought Nilakkal, the base camp, they gave in writing to the police that they did not want to break the centuries-old custom of the temple, sources said. Another woman was blocked by the devotees at Marakkoottam en route to the shrine and sent back on suspicion that she has not reached the permitted age of 50. Amid mounting protest in the state against the Supreme Court order, BJP Sunday urged the Kerala government to convene a session of the assembly and pass a resolution seeking the centre's intervention to overcome the crisis. A small group of BJP leaders was arrested for violating ban orders in force under Section 144 of the CrPC at Nilakkal, a key entry point to Sabarimala. Meanwhile, the Sabarimala Karma Samithi intensified its agitation against the CPI(M)-led government's "hasty" move to implement the court order. 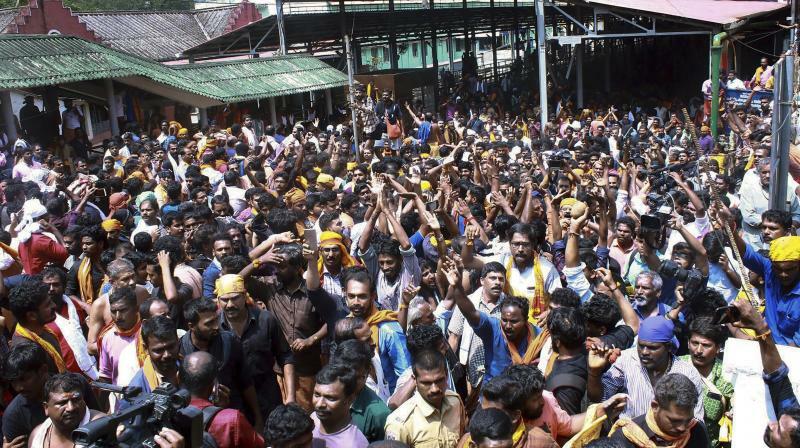 The state has been witnessing massive protests by Lord Ayyappa devotees opposing the entry of girls and women of menstrual age into the Sabarimala temple since the government decided to implement the apex court order.